In the first month of 2010, four of my friends have already turned 18. I made these cupcakes the other day for them, as super belated birthday presents as it was impossible for me to bake during exams. 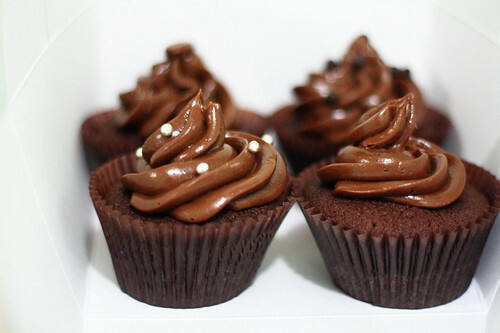 ...Back to these cupcakes. 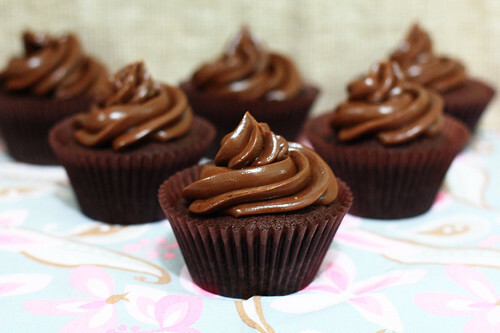 Who could resist a light yet chocolatey cupcake rounded off with a swirl of shiny, intensely chocolatey frosting. This is my first time making Swiss Meringue Buttercream, and it was a success! As per usual, I was a little scared to try the recipe before, as it requires whipping for at least 15 minutes and I was afraid that my ageing hand-held mixer might give up on the job. In the end, I had nothing to be afraid of - after 10 minutes of whipping the egg whites with the butter, watching it turn into a slosh, and then voila - clotting into a silky smooth buttercream. As for the flavour of the buttercream, I was impressed! Unlike classic buttercreams, it was not cloyingly sweet or rich as the bittersweet chocolate alleviated some of the sweetness. It also had lovely light marshmallowy touch to it, and the texture was just a perfect match to the cupcake itself. Not to mention that it pipes like a dream too - even an incompetent cupcake decorator like myself thought that it was very easy to work it. A few friends and I do think that it's still a tad too buttery, so maybe next time I'll cut the butter down. 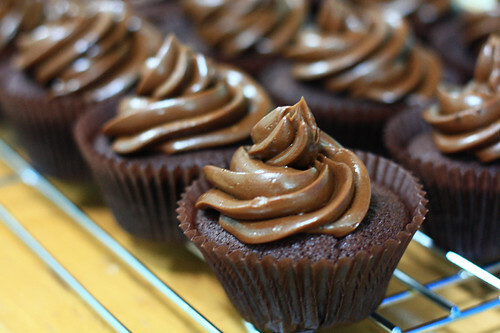 I used my favourite chocolate cupcake recipe, and once again it did not disappoint. They are really easy to whip up, and even though it only uses cocoa powder, if you use the best-quality cocoa you can get your hands on (I use Valrhona), the end result is still amazingly chocolatey and its light texture means that it's a great compliment to many frostings and fillings. And on a final note, I've decided to add printable versions (PDF format) of recipes from posts from now on! I will also convert the ingredient measurements into metric measurements (or vice versa if necessary). I personally always work by metric weight, and since I convert the units for every recipe anyway, I might as well post it up too. The online converter I use can be found here - I find it a very handy tool, as it converts measurements specifically for each food. I hope the new feature will be useful to you, and please do notify me if you spot any mistakes - I'll be happy to correct them! 2. Beat butter until softened. Add sugar and beat until light and fluffy, about 3 minutes. 3. Add eggs, one at a time, beating until well combined. 4. Measure the flour, baking powder, baking soda, salt, and cocoa powder into a small sized bowl and whisk to combine. 6. Sift in about a third of the dry ingredients to the butter/sugar and beat to combine. Add about a half of the milk/vanilla and beat to combine. Continue adding, alternating between sifted dry and wet and finishing with the dry. 7. Scoop batter into cupcake cups about 2/3’s full. Do not fill with more than that or cupcakes will overflow. 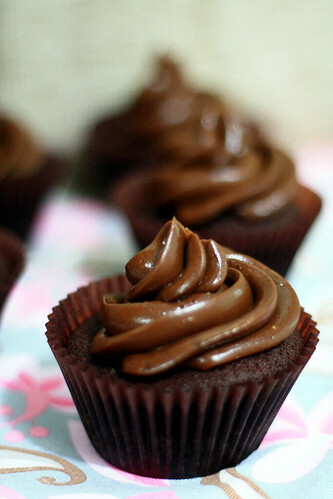 Turn oven down to 350°F (170°C) degrees and bake cupcakes for about 22-25 minutes or until a cake tester comes out clean. 1. Melt the chopped chocolate over a water bath or in the microwave. Set aside and let cool. 2. Place egg whites and sugar in a heatproof mixing bowl. 4. Remove from heat and using an electric mixer, whisk on medium speed until egg whites are cool to touch (this takes a while – should be cooler than your hand). 5. Continue beating, gradually add soft butter by tablespoon pieces and continue to beat. It will first look watery or separated, but after 10-15 minutes, it will come together. 6. Once desired, pipe-able consistency has been reached, fold in cooled chocolate until well incorporated. Lovely. Also sweet! :) Keep up the good work! Anyway, these were delicious! The frosting was SO GOOD. I can't wait to try this recipe out. I know I keep saying I'll try out your recipes, but this time I will! The cupcakes were amazing! I looove swiss meringue buttercream, it's my favorite frosting of all times! I've never made it chocolate but I'm sure it's delicious. Thanks for the metric measurements! I usually use italian meringue to decor my cupcakes, but swiss meringue buttercream has always fascinated me. And.... chocolatey! Wow! I'm sure you'll have a great time at university. It's totally a new world. Wow, these look sensational! Your SMBC looks so much more chocolatey then mine! I'll have to use your recipe next time. Good luck with everything you have going on, I'm sure you'll have a blast at the University! I'm in my last year of high school too! Wendy your blog looks great! Keep up the good work, these cupcakes look amazing! your food and photography is amazing! hi, i found your recipe when i was looking for a choc buttercream to frost a cake with. the frosting tastes delicious but after i added the choc and mixed it in, there were loads of tiny pieces of hardened choc in the buttercream, what can i do to avoid this. My buttercream came out lighter in color than those pictured here. I followed the recipe even cutting back on butter as noted. Used Callebaut chocolate. It still tasted great though. This looks great! Sent here by a fan of these and will be trying them this weekend. Thanks for posting! Hi Wendy, I always use italian meringue buttercream, which I find easier than swiss meringue buttercream, hope you don't mind me suggesting that to you. Thanks so much for adding the converter (we use cups here in Canada) and the PDF's are great! As I mentioned in earlier posts, my friend just sent me the link to your blog today, and I've already printed a few recipes to try. I also made green tea cupcakes last week and wasn't happy about the texture, so I'm glad to have found some recipes to use up my matcha powder. I made this buttercream to go in macarons, and it was delicious! Never having had Swiss meringue buttercream before, I wasn't sure what it was supposed to taste like. Is it supposed to be very buttery tasting, more so than regular buttercream? It felt like I was almost eating straight butter, with some sugar and chocolate. Which was not a bad thing! 17 year old baker from Hong Kong, balancing life between IB and a passion for baking and photography. I always bake when I need a break! This is a Flickr badge showing items in a set called sweets. Make your own badge here.